For those interested in playing some games, click on the Bulletins/Games link on the left to see a list of available games. All games are registered and fully functional. This site and BBS are free. No charges for playing the games, downloading files, etc. For guidance on how to access the games, see below. Local Yocal BBS was originally located in Delta, Pa. in the mid to late 90's and provided local Internet access, as well as a way for local neighbors to meet and chat online. Delta is a nice small community, and the time spent there was well enjoyed. 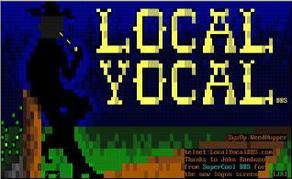 After a 12 year online absence Local Yocal is now located in Clearwater, Fl. While no longer in Delta, there are fond memories of the friends and neighbors met online "back in the day." For all you folks in Delta, Pa. that used to be Local Yocal users, come on by and check us out. If you're wondering what this was, do the same. Read below for directions on how to access the BBS. All are welcome, and I think you'll enjoy it here! In order to access the bulletins and games, you will need to logon via telnet. This is real simple to do. You can click on the link on the left, then click on connect, and you're on your way! The other option is to download the Syncterm client listed below and use it to connect. Once you launch the telnet client, login as you normally do. If you are a new user, you have two options; you can choose to login as guest to browse around and check things out, or you can choose to login as new and create your own account. There is no cost associated with creating an account, or for accessing any items on the BBS, so why not create your account and have some fun playing some games, etc. If you prefer to use a telnet client, the recommended client is SyncTERM. If you are a Windows user and do not currently have a telnet application, or would like to check out SyncTERM, click this link to download, and follow the install directions. If you use a different Operating System, or want more information about SyncTERM click on this link to see a list of install clients for the various Operating Systems. I hope you enjoy the BBS!